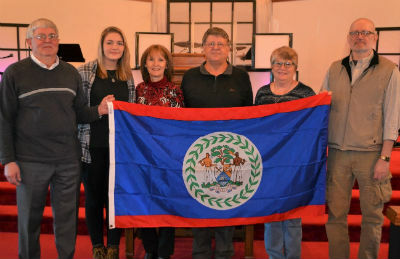 First Church missions team stands behind a Belize flag. The First Church of God of Shelby, Ohio, will send a mission team to the Central American country of Belize for a nine-day construction work camp in March. Led by Larry Cramer, president of Quality Plumbing and Heating of Shelby, this year’s group includes Michael Graham, Lydia Laug, Gwen Robertson, Larry Cramer, Sally Bevier, Mike Skidmore, and James DuBois (not pictured), a former church member now living in Nevada. Lydia, a fourteen-year-old freshman from Crestview High School, the youngest member of the team, is following a family tradition of service. Lydia’s two older sisters have gone on work camps to Belize previously. Partnering with Global Strategy and Alfonzo and Elizabeth Ayala, missionaries to Belize, the Shelby team will be working on a new church building in Billy White Village in the country of Belize. Though most of the seven-member Belize team are new to this kind of experience, the Shelby church has made more than a dozen trips to Belize doing various construction projects. 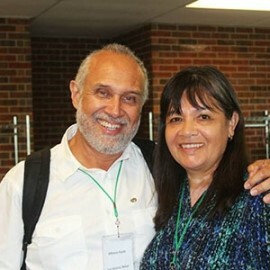 Alfonso received his medical degree from the School of Medicine of San Carlos University in Guatemala and earned a master of public health degree at the Institute of Nutrition of Central America. He is also a graduate of Anderson University School of Theology. Elizabeth received her degree as a secondary education teacher at San Carlos University. Alfonso helps church and community leaders with community initiatives, including the implementation of community service projects to satisfy basic health and educational needs. In the area of pastoral and leadership development, he facilitates training workshops and courses with pastors and teachers. Equipping and supporting pastors is a priority. He participates and teaches in regional, national, and local conferences; retreats; and seminars. Elizabeth encourages, mentors, and coaches former students and high school teachers in their educational endeavors and challenges. She meets with women’s groups and individuals for fellowship, counseling, mutual edification, and friendship. Through the Faith Promise missions program of the Shelby church, funds are raised for the Belize project, and all members are urged to contribute candy, small personal items, clothing, and caps to give to the people being served, but each member of the mission team pays their own expenses for the trip. Dates for the trip are March 6 through 16. For more information about the Belize trip or the First Church of God of Shelby, please contact Pastor Johnny at 419-342-4636, or visit the church’s website www.fcogshelby.com. Johnny Creasong is the pastor of First Church of God in Shelby, Ohio. Learn more about Global Strategy at www.chogglobal.org. This entry was posted in All Church of God, Great Lakes and tagged Ayala, Belize, Faith Promise, First Church of God, global, international, Johnny Creasong, mission trip, missions, OH, Ohio, Shelby, short-term missions, work camp, work team. Bookmark the permalink.